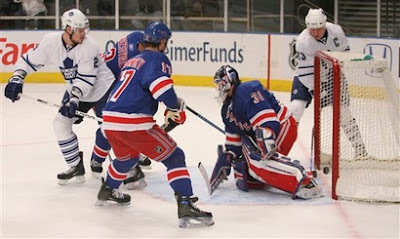 The New York Rangers entered the third period against the Toronto Maple Leafs Thursday night down 4-2 and decided to pull Henrik Lundqvist. Do you think that maybe he needs a break? Lundqvist has started in 9 out of the past 10 games and 26 out of 28 games overall. So far, a third of the way through this season, even the biggest Devil’s fan would have to admit that Hank is a serious Vezina Trophy contender. He entered today in the top three of the four major goalie statistics, first in wins (14), second in goals against average(1.91), second in shutouts(4), and third in save percentage(.927%). Those stats aren’t going to last if he doesn’t get a breather soon. He has given up four goals in each of the past two games. Not only has he not done that yet this season,s it’s only the second and third time he’s given up four goals or more in any games this season. The major issue here is with backup Steve Valiquette. While he has played fairly well this year he is not the type of player you want starting 20 to 25 games for your team and because of this Hank never gets a night off. In his defense he hasn’t gotten much of a chance to show he can be a strong backup. He’s only started two games this season and just one in four months with the team last season. There are two ways to solve this problem. The Rangers can use Valiquette more and find out if he can actually become a solid backup. They can also call up Al Montoya who is healthy again after spending half of November sitting because of an injury. If the Rangers don’t like either of these options they should begin to look for a backup now because if Lundqvist has to keep playing 9 out of 10 games he will eventually break down along with the Ranger’s cup hopes.